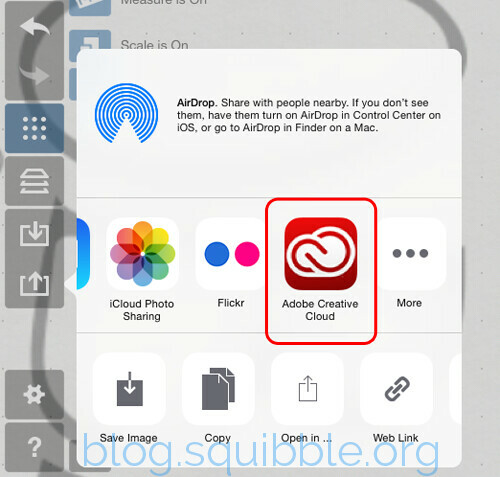 Squibble Design Blog | Web Design, Illustration, Animation, Design and Craft - Quick Run-down: Using Adobe CC Mobile Apps Without an Adobe CC Subscription. 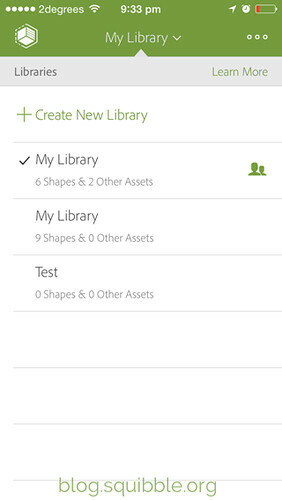 Quick Run-down: Using Adobe CC Mobile Apps Without an Adobe CC Subscription. Recently I have been testing out some iOS apps from Adobe that export your your drawings and sketches to Creative Cloud. Although I have the free Creative Cloud account with 2GB of storage, I do not use any CC apps as I already have Adobe Photoshop CS 5.5 and use Bohemian Sketch for vector designs. However, It has still been fun to play around with Adobe Shape, the Adobe Creative Cloud Moleskine app, and Adobe Illustrator Draw. I can access most of the files created by the apps with my Creative Cloud storage account and re-use them elsewhere. The Adobe Moleskine Creative Cloud app is a lot of fun. The notebook for use with this app is not available in New Zealand yet but I have been testing it using a regular notebook and have had passable results about 80% of the time. The official notebook has registration marks that allow the app to size your drawing correctly. This means you can get some slightly funky-looking results when using a notebook without the proper registration marks. Using this app, you can download the generated SVG files directly from the 'Assets' folder in your Creative Cloud account to your computer. The line quality of the SVG conversion is not as clean as I would like, but still usable for rough sketches and rough mockups. 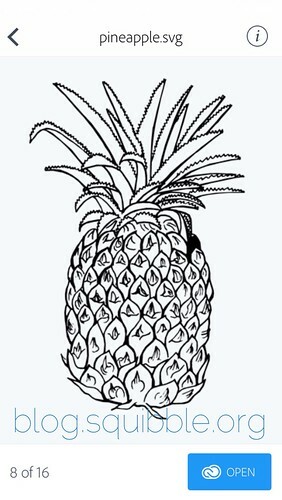 The conversion works best on very simple line drawings, anything with too much detail is best avoided. I love using these these two apps together. I ink sketches and then take a photo using Adobe Shape on my phone. 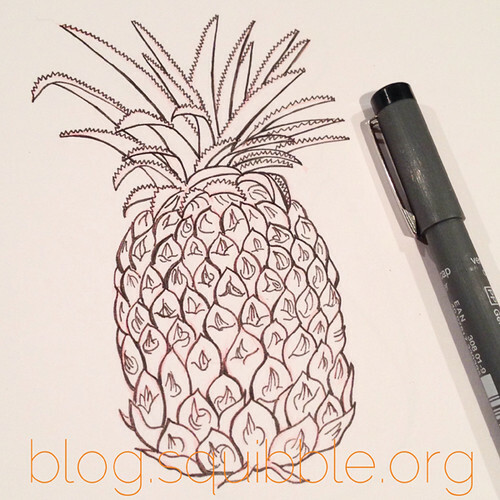 The conversion of the line art is of better quality than the Adobe Moleskine app. I can then import the sketches into Adobe Illustrator Draw on my iPad and continue to work on them there. I found that it was better to take photos of small parts of a larger sketch and then I used Adobe Illustrator Draw to combine the parts together. But what if you want to then continue work on your digital sketches on your desktop? The main issue arises when you wish to download SVG files you have created in Adobe Illustrator Draw* from your Creative Cloud account for use with anything other than Adobe Photoshop CC or Illustrator CC. Unlike the Moleskine App, Adobe Illustrator Draw stores your creations in your 'Libraries' folder, rather than in your 'Assets'. In the context of Adobe CC, this makes perfect sense as any files stored in your Libraries are then automatically available to your Adobe CC desktop apps. 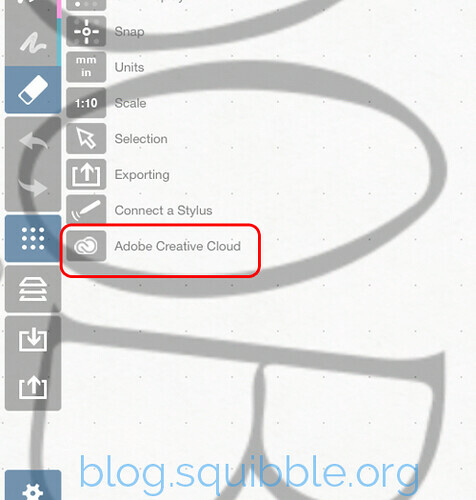 In the mobile apps you can click a button to send the file directly to Adobe Creative Cloud. However if like me you don't have a subscription to Adobe CC because you are still using a slightly earlier version of the software, then you're out of luck. There is no option to download the SVG directly and save it to your computer once it has been saved to your libraries. I am currently testing 'Concepts' for iPad. This app links to your Adobe Creative Cloud account and allows you access to the CC libraries so you can import your SVG files created previously in Adobe Ilustrator Draw. After I have finished working with a file in Concepts, I can export it as either a JPG, PNG, SVG, or even a DXF or layered PSD file. I am still experimenting with these apps, so I will post new updates on my processes here! *Please Note: If you are still using Adobe Ideas as part of your daily workflow, It may be a good idea to not 'upgrade' the app to Adobe Illustrator Draw. The useful export to PDF option you may have been reliant on is missing, and you cannot downgrade back to Adobe Ideas. In effect, you will be forced to update your desktop apps to Adobe CC.